I first had this salad at Ruth’s Chris Steakhouse several years ago, and was completely blown away. I’d never had a salad that was served with a warm dressing, much less one that had a bunch of bacon drippings added to the mix. It’s just enough to barely wilt the spinach, red onions, and thinly sliced mushrooms. It couldn’t be any easier to make at home either, and makes for a wonderful lunch or dressier side salad for dinner. I served it with alongside the French onion soup I made last week, and it was great. This is Alton Brown’s recipe (because you can never go wrong with AB), and it uses red wine vinegar. But, I’ve also used balsamic as well – and just cut out the sugar from the recipe. Hands down, my favorite salad. Make it! Place the eggs into a small saucepan, cover with water, and place over medium-high heat with the lid on. Bring to boil. Once boiling, turn off heat and let sit covered for 12 minutes. Drain, cool, and peel the eggs. Slice egg and set aside. 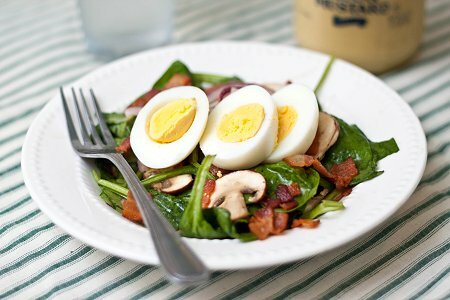 A perfect autumn salad with spinach. Love warm bacon dressing. This sounds like the most perfect salad, ever. I can’t wait to make it! I used to make this years ago when I was first married. Forgot about it, but I will be making it again.